Police investigating incidents of Buzzard poisonings have now discovered two dead fox cubs and are warning countryside users to be vigilant. One cub was found on land in Kirk Ireton on Saturday, May 1 with a second cub discovered nearby the following day. Officers launched an investigation when four dead Buzzards were found on land north of Kirk Ireton village on April 7. Two birds were also found dead in Jebbs Lane, Idridgehay on February 22. Results from analysis undertaken by Natural England confirm the birds were poisoned. Police are linking the death of the cubs to the Buzzard poisonings and a multi-agency investigation is ongoing. A police spokeswoman said: “Whoever is laying poison in the area has not stopped doing so and there is a real concern that dogs being walked, or children playing in the fields, could discover poisoned animals and come to serious harm. 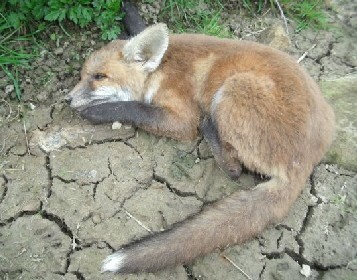 Wildlife conservation charity, the RSPB, has offered a reward of up to £1,000 for information leading to a conviction. RSPB Investigations Officer Mark Thomas said: “While the Buzzard is the UK’s commonest bird of prey and slowly regaining its previous range, its current distribution in the UK still reflects past illegal persecution and poisoning. If anyone has information about these incidents they are urged to call the police on 0345 123 3333, Crimestoppers on 0800 555 111 or the RSPB’s Investigations team on 01767 680551.